Size: 18 x 18 x 27.5"
10.5 x 10.5 x 13.5" 15 x 15 x 23" 18 x 18 x 27.5" 24 x 24 x 36" 35 x 35 x 35"
47 x 47 x 47"
Box Dimensions (LxWxH) 29.5 x 19.5 x 1.5"
Digital Light Shed - Large (18 x 18 x 27.5") is rated 4.6 out of 5 by 64. Rated 4 out of 5 by JoBe Images from Great product for the money I use this product for professional product photography. I haven't had the light shed that long but have been pleased with it overall. The quality of the material is great and provides the very necessary soft, non-reflective environment required for high-end product photography. You will have to iron the cloth included so prepare ahead of time. You will also need a descent wide-angle lens in the event you are using the total width of the shed. I did not have any issues with the zippers inhibiting light entering the shed. Accessibility to the product using the side velcro panel was very convenient. Rated 4 out of 5 by UrbexGuy from Well Designed, not for Point 'n Shoots I purchased this for my wife for Christmas to sell her pottery on Esty. I am VERY pleased with it using my DSLR doing a couple shots for product photography examples for a friend of mine. Velcro is REALLY tight, box is very study, and folds away very nicely. Only complaint I have is the zipper opening are TO tight for my wife's point n shoot . You have to basically have two people to operate the box when a product is completely inside (w/o opening a panel). However, we will solve by putting in our back room and only letting her shoot at night so it's dark and you can keep a panel open. 9/10 product. Rated 2 out of 5 by Anonymous from Digital Light Shed - Large 18 x 18 x 27. The tent itself is not bad, works fine. The two pieces of material they give you are not great, they are lint/dust generators so if your doing jewelery get them out quick and put something else in there. Rated 4 out of 5 by Anonymous from Capable Light Tent Easy to set up, sturdy, but flexible. Good quality construction. Nice carrier. Good diffusion, but sometimes needed an additional diffuser (using speedlights). 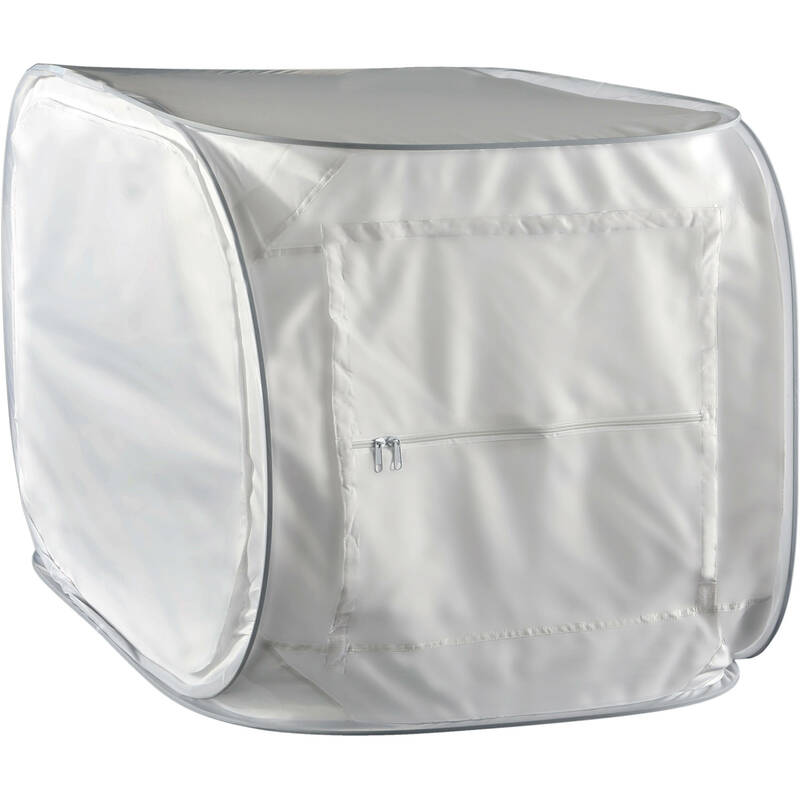 Like the large removeable bottom panel (useful for outdoor flower/cactus work), like that it can be used as a tall tent shooting through the open bottem too. Good object access and good camera placement, though the zippers could be longer. The only cons (not huge) are the included fabric backgrounds. Only black and white. Severely creased (but ironable). The bigger issue is that the well designed and thoughtfully placed velcro holders in the corners of the tent use the soft fuzz and have the hooks on the fabric. If they'd put the the hook tape in the tent, you could easily buy a brushed fabric and jam them on there. As is, you have to buy fabric, and put on hook tape. Rated 5 out of 5 by Arthur from Excellent well-priced product I bought this because the tent I was using is fussy to assemble and disassemble, and rigid and bulky once assembled. This product is exceptionally easy to unfold and fold, and packs down tightly enough to pack for travel. There is tons of functionality designed in and lots of nice features, e.g. velcro tabs front and back to hold backdrops and the rigid plastic floor. I work primarily with natural light, and the ability to open either the front or the side - or both - offers lots of control. The cloth backdrops are good, but I had to iron the creases out of them and they have a bit too much texture. This is easily eliminated in processing, but I find it easier to work with paper backdrops. Rated 5 out of 5 by nlmcc from Great value with lots of features I've used this light shed to shoot small product shots and small fine art objects with great success. The included black and white backdrops and opaque plastic bottom are imminently versatile even allowing you to light from the bottom. The price is certainly right! Rated 4 out of 5 by Brent from Very flexible and effective usage I use the light shed for macrography. It does a great job at providing a soft diffuse light. Folds up easily when not being used. Love the removable bottom so that the shed can simply be placed over a scene. Rated 4 out of 5 by Natog from Easy Setup - Easy to Light I use this for product shots and macro still life. It turns your kitchen table into a studio. I use 3 flashes, one above, and the other two on the sides, or sometimes one side and behind. Setup is quick and easy, and the price is very reasonable for what you get in this package. You have to be a little creative in its use, there are access ports on several sides, and you can position it in portrait or landscape orientations. The material diffuses the light very well, and it is easy to create an even, soft lighting environment. Larger objects are harder to light from the front, so I usually use some reflectors near the camera as fill. There are a variety of zippers and velcro bits, which may appear in your photos. The interior space is fairly small, so sometimes to get the angle you want a bit of cloning is required to clean up the background. A white piece of cloth is included to hide these areas, but it is heavily creased from the packaging. All in all, a very nice little unit. It folds flat and comes with a carry case. I only wish I had bought this years ago. Would it be possible for me to get a copy of a receipt for a product I ordered from your company? My order conf. No: 636194070. To obtain a copy of your receipt, please contact our Customer Service Department by phone at 1-800-221-5743 / 212-239-7765 or e-mail to cs@bandh.com.